I've been meaning to post a 'review' of these books for a while now and I'm finally doing it. I've mentioned the books in a previous post (All Vamped Out) and it wasn't exactly a glowing mention. At the time I think I'd read the first 3 books. I'm now about to finish the 6th book and my opinion has changed somewhat. I still don't like Bill. But I do like Sookie and the books a lot more. They are turning out to be a lot more than just another set of 'vampire' novels. 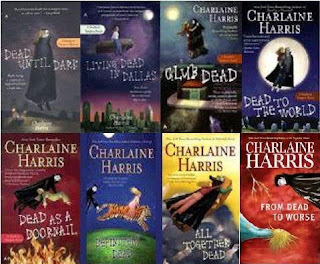 Charlaine Harris incorporates more and more supernaturals into each book and this makes them way more interesting. Sookie has now encountered everything from Werewolves to shape-shifters (totally different, apparently! ), fairies and demons, and that's just the first 6 books. The Vampires are always present, but the stories don't centre around them as much as the first few (which I suppose they had to, to introduce the whole thing!) and I think that's why I'm enjoying them more. If you enjoy books that explore the supernatural and various folklore in a simple, interesting way then these books are for you. If you're looking for 'vampire romance' then perhaps these aren't so much for you. These books are a quick easy read, with neat little endings that resolve all the mystery. One thing I will say though, is that there is always a sub-story that has nothing to do with the main 'mystery' and you can pick the answer to these a mile away. Apart from that, I give these books (from Book Four onwards) a Thumbs Up. I'm in on the Sookie Stackhouse challenge, too, but haven't started reading the books. Thanks for the review! Anyhoo will give them a look up!